The Floraframe Recirc 24 is an easy plug-and-play way to grow living walls anywhere. This display of philodendrons photos, manterra, begonia and other tropicals automatically waters itself from it's 5 gallon tank. 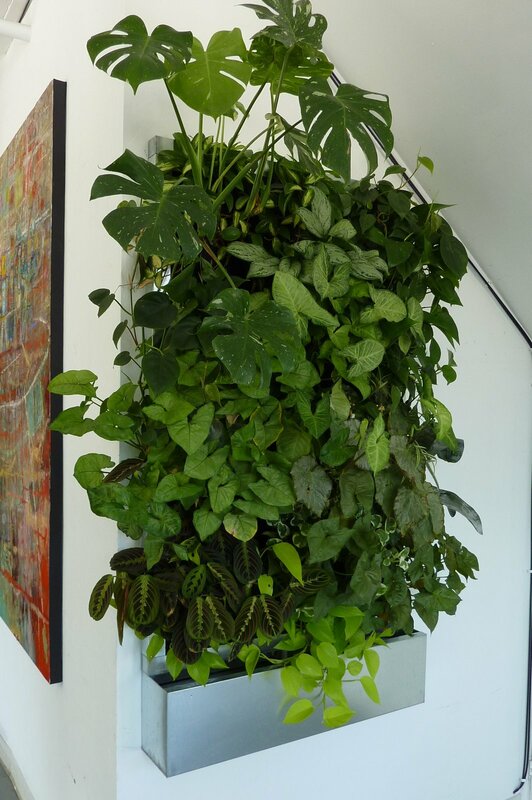 A pump and timer waters the framed living wall panel once a day for 30 minutes. The water basin can be topped off once a week. A light fertilizer solution keeps the plants fed and healthy. Floraframe Recirc 24 at PlantsOnWalls Showroom. Newer PostFern Wall for Urban Bistro. Burlingame, California.